In comics radiation often leads people into having fantastic powers. Just look at Spider-Man or Firestorm. However, few get cancer. With the health issue one of the world's most common threats, why don't we see that ratio mirrored in our comic heroes? Enter The Mighty Titan. 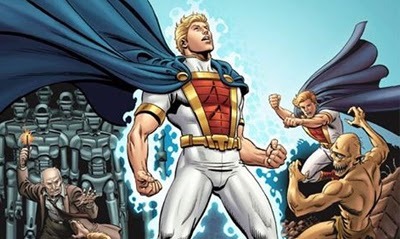 Creator, Joe Martino, himself a cancer fighter, has created a hit KickStarter campaign about the world's mightiest mortal, whose secret identity is facing the 'neverending battle' against cancer. Each issue has broken sales goals across the park, the funding for #3 was raised in just 36 hours! 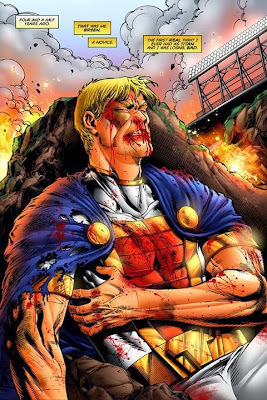 Comic pro's have also been quick to support his plight, including 'good girl' artist Franchesco, Bryan The Authority Hitch, and the legendary Jerry Ordway (above). Joe Martino) In 2004 I was diagnosed with adeno cell carcinoma. It is a fancy word for Kidney Cancer. After my surgery (where they took one tenth of my kidney with the tumor) I was really down and I was thinking how I didn't think anything could hurt me before this. I started to think about how an invulnerable hero was inflicted with this potentially fatal disease. Originally I was thinking of giving Shadowflame (Joe's other Red Anvil comic creation) cancer, but he doesn't have the support structure that I wanted to show. Titan was born from that. 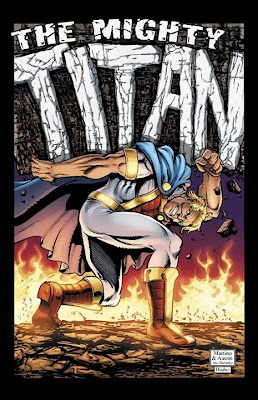 IADW) For a Kickstarter project only up to it's third issue, The Might Titan has smashed every fundraising goal it's set. Add in a hot creative team and artistic extras from the likes of Steve Lightle, John Byrne and more, and I have to ask, what do you feel it is about this project that sees so many people flood in behind it? J.M) I don't know! I would like to think that it is the honesty of it. My first Kickstarter was tough. It literally put me in the hospital. The second and third have been well received, I think mostly because I came through on the 1st one and the second one is packed up and ready to ship. Either way it is tough. I always say that I couldn't go viral even if I had Ebola! IADW) I'm Mr Nureader. What do I need to know about The Mighty Titan to jump onboard? J.M) That you don't have to be afflicted with cancer to read and enjoy it. There are plenty of vile villains and super-heroics to keep die hard comic fans entertained. I didn't write this to let people know what chemo feels like. This is more of an emotional roller-coaster ride. How a person, whether they are invulnerable or not, can lose the luxury of a clear mind with a cancer diagnosis. Even the most powerful person in the world can lose his way but not so much that he couldn't come back from it. It is easier than you think to lose the things that you always thought would be there. IADW) Donating to this project isn't as expensive as many people would think. How important was it to have a range of cost options and rewards, so anyone could afford to help get The Mighty Titan flying? J.M) I want people to read this. It needs to be accessible. For $7 you get the book at pretty much my cost with printing, shipping, fees and taxes. I am not looking to get rich. I want people to read what I am writing or drawing at the time. IADW) What has the process of creating Titan's adventures brought to you? J.M) The opening of doors that I had locked away. When I was sick I shut the world out and buried my pain. This has been cathartic for me as I am reliving a lot of the emotions and fears that I didn't deal with the first time. When I am writing something and it makes my stomach hurt, I know I hit on something that will resonate with people. That is the ultimate goal. IADW) The core of this series could really be beneficial in terms of escapism for kids dealing with cancer. Are there any plans or thoughts for The Mighty Titan beyond its first five issues? J.M) There is a way to continue if the demand is there. I think that young adults will probably get more out of this than kids. I am a little concerned with children getting more scared with a book like this. They are already going through so much. I do plan on doing a kid friendly comic for kids with cancer. Time will tell on that. What do you think? Personally, this is a brilliant project, and one that comics actually needs. I wish Joe all the best with both his own health challenges and the future of The Mighty Titan and thank him for his time in doing this interview. To learn more or check out the wallet friendly funding options Joe offers, please visit him on Facebook or Kickstarter today. This is a truly brilliant idea. Even from just a comic book standpoint, placing a hero into a very real world personal conflict that has nothing to do with just who to date on a Friday night. It makes it seem more real, more grounded in the world we know. Which in turn makes us connect with the character, and empathize or sympathize depending on our own life experiences. I don't know anyone in my personal life who hasn't had or been affected by someone who's had cancer. And whether they win or lose the battle the emotions run the spectrum. Kudos to Joe, and well wishes on his fight. Thanks Random, I reckon it's a brilliant idea too, and hope Joe's successes keep building. He really puts his all into this title and it shows.